Nikita Sergeyevich Khrushchev[lower-alpha 1] (April 15 [A.S. April 3] 1894 – September 11, 1971) wis a Roushie politeecian who led the Soviet Union during pairt o the Cauld War as the First Secretar o the Communist Pairty o the Soviet Union frae 1953 tae 1964, an as Chairman o the Cooncil o Meenisters, or Premier, from 1958 tae 1964. Khrushchev wis responsible for the de-Stalinisation o the Soviet Union, for backin the progress o the early Soviet space programme, an for several relatively leeberal reforms in auries o domestic policy. Khrushchev's pairty colleagues remuived him from pouer in 1964, replacin him wi Leonid Brezhnev as First Secretar an Alexei Kosygin as Premier. Khrushchev wis born in 1894 in the veelage o Kalinovka, that is close tae the present-day mairch atween Roushie an Ukraine. He wis employed as a metal wirker in his youth, an he wis a poleetical commissar in the Roushie Ceevil War. Wi the help o Lazar Kaganovich, he wirked his wey up the Soviet hierarchy. He supportit Joseph Stalin's purges, an appruived thoosands o arrests. In 1938, Stalin sent him tae govren Ukraine, an he conteena'd the purges thare. In whit wis kent in the Soviet Union as the Great Patriotic War (Eastren Front o Warld War II), Khrushchev wis again a commissar, servin as an intermediary atween Stalin an his generals. Khrushchev wis present at the bluidy defence o Stalingrad, a fact he teuk great pride in ootthrou his life. Efter the war, he returned tae Ukraine afore bein recried tae Moscow as ane o Stalin's close advisers. Stalin's daith in 1953 caused a pouer struggle, frae that Khrushchev ultimately emerged veectorious. On 25 Februar 1956, at the 20t Pairty Congress, he deleevered the "Saicret Speech", that denoonced Stalin's purges an ushered in a less repressive era in the Soviet Union. His domestic policies, aimed at betterin the lives o ordinar ceetizens, war eften ineffective, especially in agricultur. Haipin eventually tae rely on missiles for naitional defence, Khrushchev ordered major cuts in conventional forces. Despite the cuts, Khrushchev's rule saw the maist tense years o the Cold War, culminatin in the Cuban Missile Creesis. Khruschev's popularity wis eroded bi flaws in his policies. This embauldened his potential opponents, that quietly rose in strenth an deponed the Premier in October 1964. Houiver, he did nae suffer the deidly fate o previous Soviet pouer struggles, an wis pensioned aff wi an apairtment in Moscow an a dacha in the kintraside. His lenthy memoirs war smuggled tae the Wast an published in pairt in 1970. 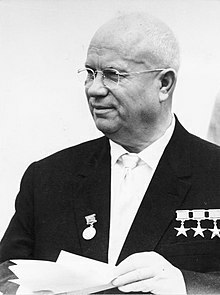 Khrushchev dee'd in 1971 o hert disease.